Following a campaign by local residents and relatives on the memorial, supported by Stockwell's Labour councillors, the Stockwell War Memorial has now been restored to its former glory, along with improvements to the gardens. The mural on the underground shelter has also been repainted thanks to the activity of local volunteers, helped by the original artist, Brian Barnes and the London Mural Preservation Society. To celebrate this, The Friends of Stockwell War Memorial and Gardens are inviting everyone to the unveiling of a plaque at Stockwell Memorial Gardens on Saturday 14 September at 12 noon. The Mayor of Lambeth, Councillor Mark Bennett, will be doing the honours. 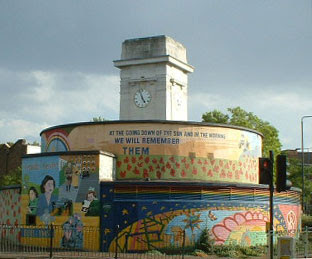 The clock tower, which lists 574 Stockwell men who died in the Great War, was unveiled in 1922. In recent years, its condition had deteriorated and some of the carvings had become worn. Sheila Dartnell and Naomi Klein of the Friends of Stockwell War Memorial and Gardens brought the plight of the memorial, a Grade II listed structure, to the attention of Lambeth, who responded last year with a plan to improve the entire Memorial Gardens as well as four other memorials in the borough. Working with Lambeth Council, the Friends of Stockwell War Memorial and Gardens developed a comprehensive plan to bring the clock tower to a state suitable for next year’s centenary of the start of World War One. It included cleaning the stone and recutting some of the carving, renovating the original wooden doors and replacing the windows. At the same time, new furniture, signage and replacement trees were brought in. The work was completed in August 2013. In addition, many groups of local volunteers organised by the Friends and the London Mural Preservation Society spent hours carefully scraping off the old paint on the deep level shelter and repainting it. They were ably led by Brian Barnes, the original artist. Thanks to everyone who gave up their time. Thanks fot the post ! would you like to add some extra thing over this ?? yes.. then do reply me on this ! great post really appreciatable work. That will be valuable to everyone who uses it, including myself. Many thanks! Thanks for sharing this awesome article. I really appreciate your effort. and stay updated with all the latest information. Download Showbox. Visit my blog. Nice Post, I also have my blog. Click on below Links to check. I liked it so much and very interesting, too! Thanks for sharing the experience.Wonderful post, really great tips and advice. Stockless War Memorial is looking nice. AVG Customer Support Service Order an AVG online today and get free installation done for free of cost from technical experts. Call us toll free at +1-855-284-5355 for instant help. A good site with exciting content that is what I need. Thank you for making this web site, and I will be visiting again. It is really resourceful blog with great content. The blog is really nice & helpful for me. MAC Tech Support provides fixes for some common problems that you may be facing with your MAC System. nice to see this post. Nice post and please keep posting like this. Incredible Article it it’s truly instructive and inventive update us as often as possible with new upgrades. It was truly important. Much obliged. I just found this blog and have high hopes for it to continue. Keep up the great work, it’s hard to find good ones. I have added to my favorites. Thank You. Admiring time and energy you put into your website and detailed information you present. It’s great to come across a blog every once in a while that isn’t the same old rehashed information. Great work keeps it up. UC Browser is one of the most used mobile browsers you will find. Like most browsers, it too faces breakdowns from time to time. When this happens you no longer have to wait in those never-ending queues of people. You are free to straightaway call us at our toll-free UC Browser customer support number. Our phone lines are open all throughout the day 24×7 all days of the week. Upon calling you will be provided with the best in class technical help. Our technical team is highly qualified to resolve even the most tricky situation. Very informative article. Loved your effort in brining such a value to the content. Thanks for sharing. thanks to share nice information. We are providing the exact solution to any issue that is related to the Kaspersky Customer Service, and the main aim of our team is that provide the solution and every customer will be satisfied. How you install or reinstall Office 365 or Office 2016 depends on whether your Office product is part of an Office for home or Office for business plan. If you're not sure what you have, see what office.com setup products are included in each plan and then follow the steps for your product. Office Setup, To get started with your Microsoft Office Installation you must need valid product key code & visit office com/setup and we can also help you with your entire process to setup office product online. Wireless Internet access is one of the modern conveniences of our time. However, your home wireless router can also be an access point for hackers. If your Wi-Fi router isn’t secured properly, you could be letting anyone with a wireless-enabled device gain access to your home network. That means you’re opening up your emails, banking information, and maybe even details of your smart home’s daily schedule to criminals. Office 365 is actually a Web based version of Microsoft Office Suite. It was basically designed for large scale sectors & organizations for Business purposes.